At Owen Sails we have a very busy and professional rigging department to offer our customers a fully comprehensive rigging service - whether you just need a shackle or a full mast, boom, standing and running rigging replacement. We’re fitting more and more headsail furling systems and can advise you which system will be best suited to your needs. Some of the original furling systems out there are still going strong but advances in design over the past few years have seen vast improvements in ease of use. Ever needed a rigging inspection and report for your insurance company? There is a good reason for that. Rigging is often something that is overlooked until it’s too late so don’t just step the mast and forget about it until it is unstepped at the end of the season. 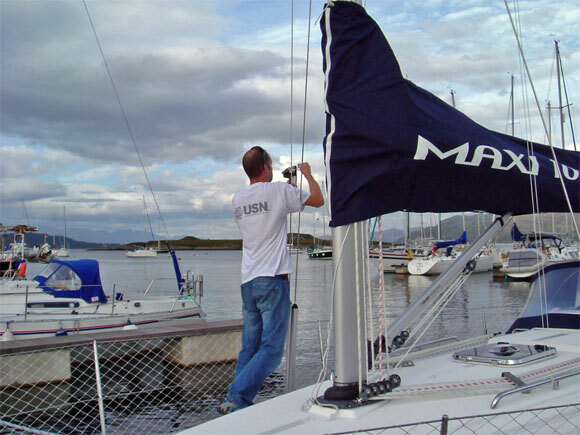 We offer a full rigging inspection and report service whether your mast is up or down, it’s best to find any faults before the slightest crack in a terminal can cause the whole thing to come crashing down. When you need your rigging replaced whether you are doing it in stages over a couple of years or all in one go then we can provide top quality replacement rigging for you. We use the best wire and terminals from Stalok www.stalok.com . All bottlescrews are “Forged from high tensile Bronze alloy. The aerodynamic design of this turnbuckle provides one of the strongest and most elegant bronze turnbuckles on the world market today.” The advantage of using a bronze bodied bottlescrew is that the threads of the body do not bind on the threads of stainless steel terminals and then seize. This can be a common problem if you have stainless bottlescrew bodies. Our rigging replacement service includes removing the old rigging from your mast, making new and refitting to your mast this includes stripping of your furling system and rebuilding it with the new forestay. This is an area of boat ownership and maintenance that is so commonly overlooked. Some boat yards make no claim to have set the correct tension once they have restepped the mast at the start of the season. It is extremely important that the mast is set up correctly – not only for good sailing performance but from a safety point of view. Rig tuning can seem like a bit of a black art when first seen and it’s only when you have carried out as many as our riggers have that you get a good feel for it. Rig tuning is directly linked to how the sails work and where the centre of effort of the sails is acting, so having the correct shape and tension in your mast along with correct sail trim will have you cruising along perfectly balanced without having to fight the rudder. We use professional Loos gauges to determine correct tension in your rigging and have a dedicated team who will be able to set your rig up with all the bends in the all right places! Here at Owen Sails we offer a full service for getting you going at the start of the season, full boat setup including fitting your boom, sails, covers and very importantly getting your rig tensioned to the correct static settings. Grubby old ropes? We can sort you out with a full set of halyards and sheets or just individual replacements. We offer a full service for making new halyards including spliced eyes, shackles and whippings in all sorts of rope construction from 3 strand ropes to racing dyneema. There is nothing quite like a new set of sheets and halyards to make your boat look and feel like new! Here at Owen Sails we are able to provide you with a complete replacement mast solution. If your mast is past its best and it’s time to change or if disaster strikes we can undertake full mast and rigging replacement. We work with insurance companies to provide you with a full replacement of mast, boom and all associated rigging. Not being tied to any manufacturer gives us the opportunity to supply masts from Selden, ZSpars, Francespar or any other mast manufacturer. Winches, Clutches, Splicing, Rigging, Halyards, Sheets, Rig Tuning, Blocks, Shackles, Masts, Booms, Kickers, Cleats, Furling Systems, Boat Setup, Sheaves, Goosenecks…..We do more than you think! !